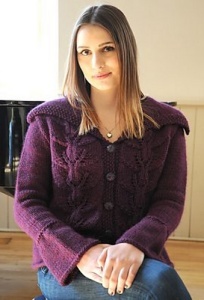 The Leaf Panel Jacket was designed by Michele Meadows for Mirasol Yarns: This is a pretty jacket, with leaf panels on both fronts and halfway up the back, the sleeves have a bell shaped cuff and the collar and button borders are worked in as you go. Size US 10 needles (or size needed to obtain gauge), stitch markers, stitch holders, a tapestry needle, and 4 "medium" sized buttons are required but not included. Finished Bust Measurements: 36 (38, 40, 42, 44)" after blocking. Gauge: 15 sts & 20 rows over 4"